This is an age old tradition. Many people have forgotten the traditions. Also, even if they are interested, they do not have elders to clarify on traditions. I am posting this, as I felt this post would be useful for the youngsters / future generations(in our family and readers' family) who are interested in knowing our tradition, customs and culture. I have posted what all I have learnt from my elders. Hope this guide will be useful and informative for everyone. I would be happy if the post serves it purpose. I have posted the details I learnt from my elders, so that it will be a ready- reckoner for everyone, the future generations of our family and me as well. If you have any other doubt, please feel free to message me through the contact form. Scroll down to the end of this post for recipe links. The Tamil month 'Purattasi', sixth month in Tamil Calendar is very auspicious to Tamilians and is dedicated to Lord Venkateswara (Balaji). Some people fast on all 'Purattasi Saturdays', even without drinking water. Some people observe partial fasting on all days in Purattasi, some others limit their fast to Purattasi Saturdays. 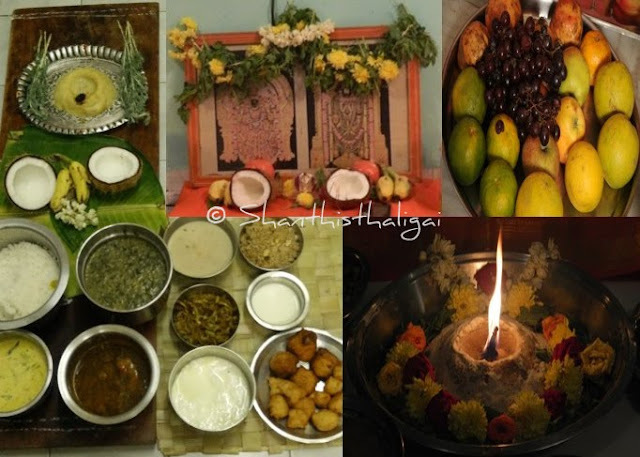 Tamil people have a ritual of offering 'maavilakku' to the GOD/GODDESS of their choice in specific Tamil months like Aadi vellikizhamai (Aadi fridays), Thai vellikizhamai and Purattasi sanikizhamai(saturday). The ritual called 'maavilakku poduthal' for Lord Balaji, is normally done on any one of the Purattasi Saturdays. Each family has a different tradition. The procedure varies from family to family. Generally, maavilakku is not lit during 'Brahmotsavam in Tirumala' and 'mahalaya paksham'. Some people do it on the 1st or 3rd or 5th saturday of Purattasi month. Likewise, the making of maavilakku also differs with each family. Some people mix the rice flour with jaggery powder(nattu sakkarai), some with round jaggery crushed, some with sugar, and some with boora / bura sugar. Some place the 'maavu' in a banana leaf, some in silver plate etc. Some make the 'maavu' like a lamp, some like a hill and so on. The maavu is prepared freshly prepared and processed at home on the particular day. Some use store bought rice flour and some grind to a paste. And making the wick also differs in each house. Generally, for Tirupathi Perumal, it is a single wick. Some people place the wick in the rice flour and some light the regular perumal sannidhi lamps and just offer the maavu to HIM. All these procedures are done as per family traditions and it can be followed as told by elders in one's family. This is the way we do in "our home". Ask your elders for your family traditions. If there are no elders, you can follow this. In Srivaishnava Community, on Purattasi Saturday, a lamp made of rice flour, ghee and jaggery is lit and it is called "maavilakku" / "maavu thiruvilakku". 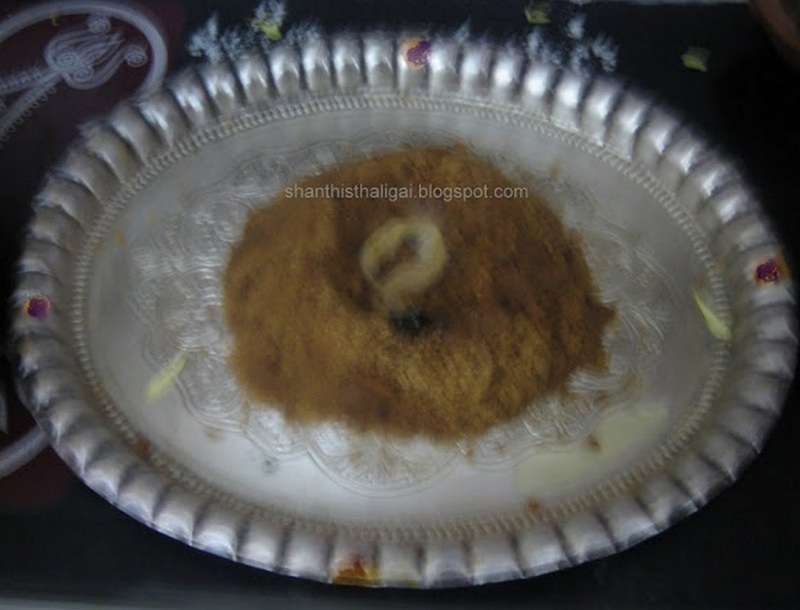 It is an offering for Perumal (the family deity). We light maavilakku in our homes, and invite Lord Malaiyappan(Tirupathi Perumal) to visit our homes. It is believed that the LORD HIMSELF comes to our home during this month to bless us and to those who cannot afford to travel to TIRUMALA. HE comes to our home and gives darshan to all of us, in the form of "JOTHI". This is indeed a great experience every year. In our family, we DO NOT light the maavilakku during "Brahmothsavam" in Tirumala as HE will be busy there and also we do not light it on "Mahalaya Paksham". So, one or two Saturdays will be left over and we have to light maavilakku in that day. If no saturdays are left, then we can light the maavilakku on "Aippasi" 1st saturday. And we make a hill with the rice flour jaggery mixture and place a thick wick. We don't use two wicks and the regular Perumal sannidhi lamps are also not lit. Maavu lamp is the only lamp we light (priority on that day is HIM only) in the early morning on this day. In the evening, we light the regular lamps with oil / ghee as usual. Nobody is supposed to eat until the LORD REACHES HIS ABODE(TIRUMALA) and this is called "Malai Eruthal". Recite Venkatesa Suprabatham and other slokas of the LORD. The nine yards saree, veshti and other clothes should be dipped in water and left to dry the previous day. Purchase flowers, banana leaf, pooja / tamboolam items, coconut, betel leaves, betel nuts, garlands etc. Also keep ready turmeric powder, kumkum, sandal powder, camphor, incense sticks, butter to make ghee for lamp. These will always be available at home. If not, shop for it too. Things can be arranged according to the rituals done in one's home. 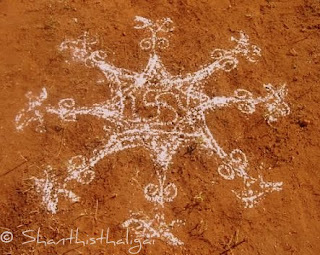 Put 'izhai kolam' in wooden planks. Keep ready. Get up early in the morning, put kolam in the frontyard. Have head bath, NOT OIL BATH, (for Perumal vilakku, we don't take oil bath), wear madisaar(madi vastram) and start doing the work. No coffee or tea. Make ghee from butter. Make preparations for the fresh rice powder. Details are given in the recipe below. Start making thaligai. 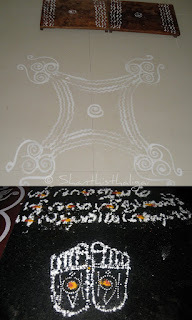 Put kolam is Perumal sannidhi. 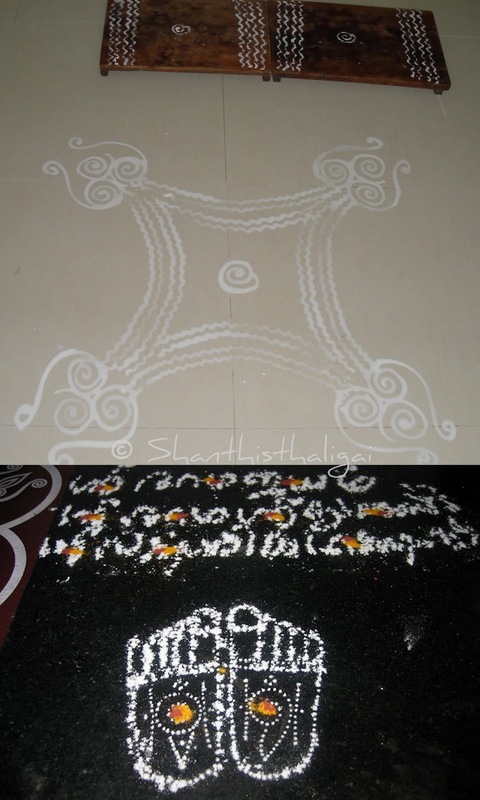 Also put kolam in the place where you are going to put maavilakku and keep the wooden planks there. Arrange thamboolam and pooja items. Wash and soak 1 cup of raw rice in water for 15- 20 minutes. In the meantime, make ghee from the butter. Drain the soaked rice and spread it on a clean(madi) cloth for 15 minutes. Grind it in a mixie to a fine powder. Sieve well and the left over can be used for the payasam. Take a silver plate. 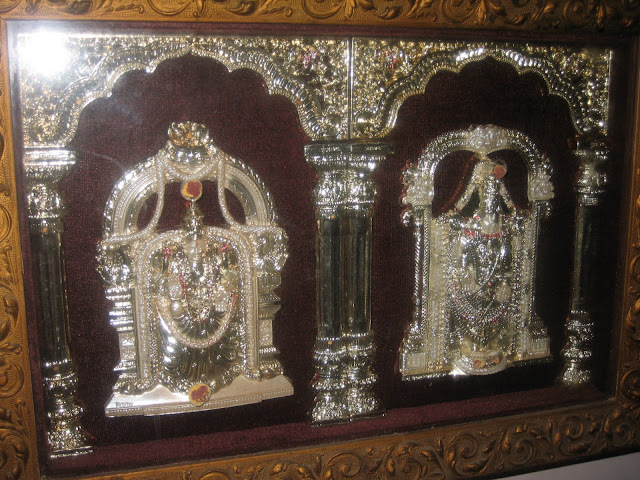 Keep chandan and kumkum on the four sides of the silver plate. Place the rice flour in the plate and add jaggery powder in the ratio 1:3/4 (1 cup rice flour:3/4 cup jaggery powder). Mix well, alongwith cardamom powder, sprinkling some elaneer (tender coconut water from the coconut which we break for our pooja. Again, some add this water and some don't) and shape it to a small mountain with a dent in the middle OR shape a lamp. Place a "thick thiri"(Wick - 3" length 1/4" thick). Keep it on the wooden plank. Pour in the ghee (I fill the dent). Place the tamboolam items in a banana leaf and keep it before the silver plate. LIGHT THE LAMP CHANTING PERUMAL SLOKAS. Recite Venkatesa Suprabatham and other slokas of the LORD. Simultaneously, do the thaligai(samayal) also and keep ready. Nobody is supposed to eat until the LORD REACHES HIS ABODE(TIRUMALA) and this is called "Malai Eruthal". Just before "Malai eruthal", when the lamp is about to go off, offer all the thaligai, milk and fruits, thamboolam and pray for the family's well-being. Take karpoora harathi. Finally take arathi. After that, remove the burnt wick, mix the dough well, and partake/distribute the prasadam. 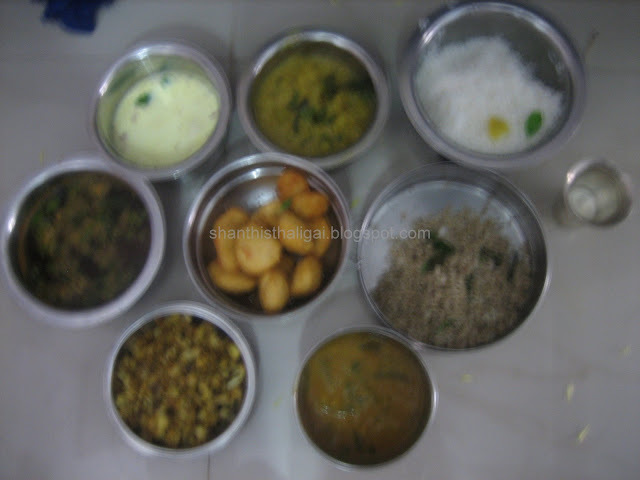 Rice, ghee, dhal, Mor kozhambhu or Paruppu kozhambu, Sathamudhu, Kootu, Kariamudhu (2), Kosumari, Ellorai, poricha appalam, vadai and payasam. Anything more can also be added. But ellorai is a must. 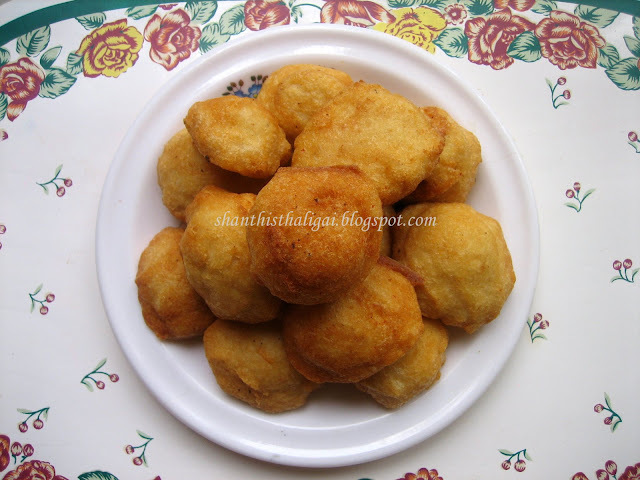 NOTE: Generally, we do not put a hole in the vadais for festivals. Wow.. Beautiful.. I just felt nostalgic after reading your post.. My grandmom makes this maavilaku in the month of "Aadi" when it is "Thiruvizha" for "Maari Amman" in our native place. Thanks for sharing it dear! Very informative post.Having read in Lifco's book about maavilakku not to be done during Brahmothsavam, I too made it last Saturday! Its inviting me for the Pooja.Nice dishes & i love that kolam. its an informative post.. never knew all these traditional things!!! Wow Shanthi Maami - my mom told me that she did her maavilakku too! Thanks for the wonderful explanation! Divine looking items! Nice post! nice to note that u r very traditional and all the kolam and neivedhiyam is really nice.I would love to see all this personally.